This recipe serves about 8 but can easily be halved for smaller families. Use a smaller cabbage and half the filling. 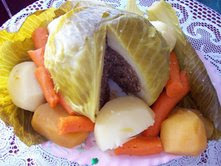 The cabbage and filling can be prepared a day ahead and refrigerated until ready to cook. The bouillon cubes are vegan beef flavored. hollowed cabbage aside and make the filling. Fry mushroom and onion in the oil until limp. In large bowl crumble tofu into small pieces like cottage cheese size. Add veggie burger, nuts and fried vegetables. Mix oatmeal, breadcrumbs, gluten, spices and together in separate bowl. Add dry ingredients to tofu mixture and mix until well blended together. Use your hands to get it well mixed. Dissolve the bouillon cube in the hot water and add it to the cold water. Add the water until mixture is soft but not oozing water. You may need more or less depending on the wetness of the tofu. Taste the filling and adjust seasonings if needed. Use this mixture to fill the cabbage. Any left over filling can be made into patties and fried for another meal. Lightly salt the inside of the cabbage and fill with the “meat” filling. Lay the 3 or 4 good leaves that you put aside on top of the meat to cover. Sit the stuffed cabbage (stuffing side up) in the middle of the cheese cloth or a clean dish towel, and bring the four corners of the cloth up to enclose the cabbage. Tie the cloth tightly on cabbage. Place the cabbage in a pot of boiling water in which a trivet or canning ring has been placed so the cabbage will not be sitting directly on the bottom of the pot. Put the bouillon cube and onions in with the cabbage. Taste broth and adjust for salt. Cover pot, turn heat down and boil gently for 1 1/2 -2 hours or until cabbage is cooked. Test with fork.